Endpoint optimization for enterprise users. PC performance affects office productivity but when your business has a large number of endpoints, maintaining each one feels like a never-ending task. Free Trial Get CCleaner Network! Get CCleaner Network! CCleaner Network gives you a complete overview of your computers. Its cleaning power solves and prevents common problems faced by end users, frees up valuable hard disk space and helps Windows to run faster. CCleaner Network removes temporary files, memory dumps, log files and other unnecessary data. The Professional edition also defragments hard drives. The result is endpoints that last longer. Uninstalled software can leave behind Registry keys and broken items which can cause crashes that lead to data loss. 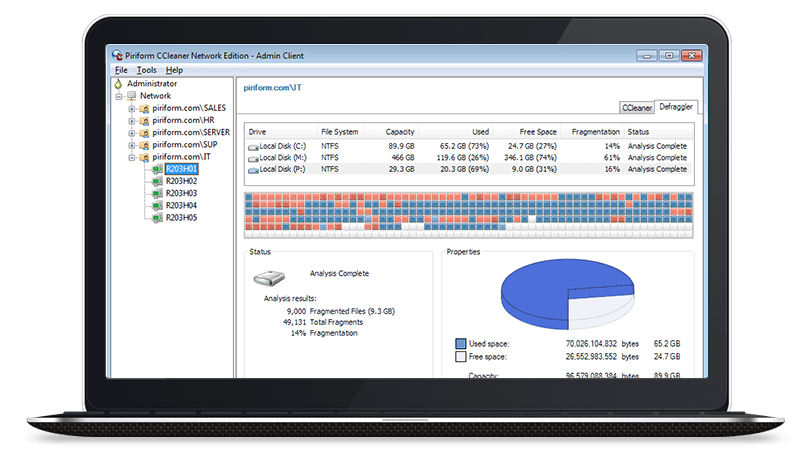 CCleaner Network cleans the Registry to improve system stability and help prevent data loss. Browser history, cookies, and logs can be security risks. CCleaner Network erases them safely, and can wipe free space and MFT free space. To tailor cleaning to specific business needs, endpoints can be organized into groups. Analyze, clean or change the settings of individual machines, custom workgroups or the entire network at once. Once CCleaner Network is installed, the endpoint agent can be remotely deployed across the network. No time-consuming agent installation across individual machines required!